Robert E. Peterson, 81, of Findlay, died at 7:59 p.m., surrounded by his loving family, on Monday, July 30, 2007 at his residence. He was born on August 28, 1925 in Hancock County to the late Clarence V. and Grace E. (Garrett) Peterson. 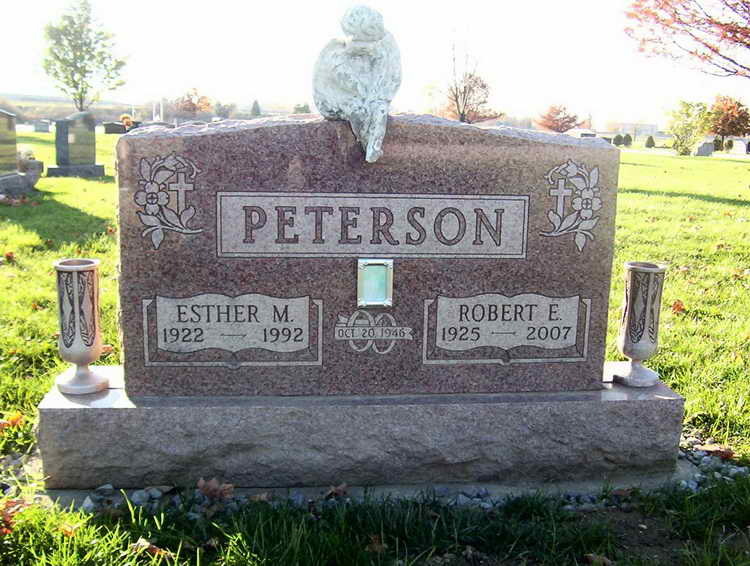 He married Esther Street on October 20, 1946 and she preceded him in death on May 28, 1992. He later married Alberta Norton on October 16, 1993 and she survives. Robert retired from Ball Metal in August of 1990. He was a U.S. Army Veteran having served our country in the 82nd Airborne Division in the European Division during World War II. He was a member of Trinity Baptist Church, Findlay. Also survivng are sons, Randall (Linda) Peterson of Ada and Phillip (Roz) Peterson of Topsham, ME; step-sons, Doug (Karen) Norton of Findlay and Dean Norton of Findlay; step-daughters, Diana (Thomas) Lorenz of Harleysville, PA and Debbie (Steve) Short of Findlay; 6 grandchildren, 12 step-grandchildren, 3 great-grandchildren and 9 step-great-grandchildren; a brother, Raymon C. Peterson of Fort Worth, Texas. An infant daughter and sister, Virginia Alge also preceded him in death. A funeral service will be held at 11 a.m., Thursday, August 2, 2007 at COLDREN-CRATES FUNERAL HOME, Findlay, with Seniors Minister Herbert Ragland officiating. Burial will be in Maple Grove Cemetery, Findlay, where the Hancock County Veterans Memorial Squad will conduct full military rites. Visitation will be from 5-8 p.m., Wednesday at the funeral home. Memorial contributions may be made to Cancer Patient Services and/or Bridge Home Health and Hospice, in his memory. 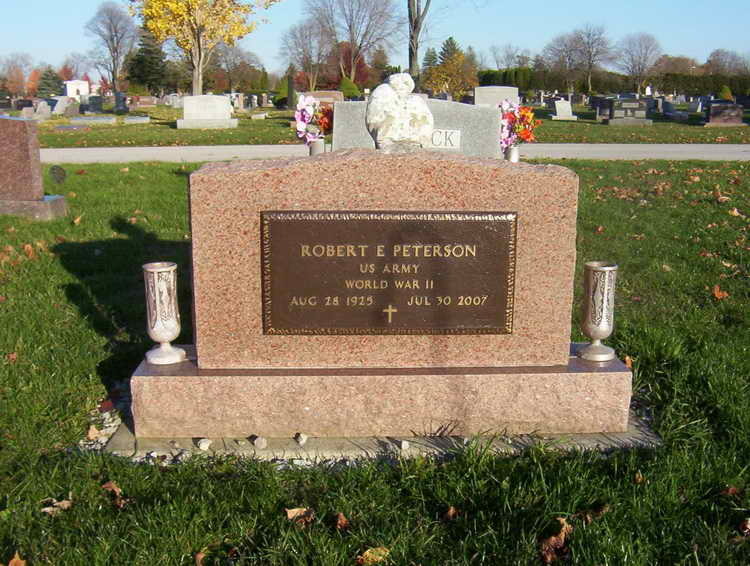 Grave markers for Robert E. Peterson in the Maple Grove Cemetery, Findlay (Hancock county), Ohio. Robert enlisted at Ft Hayes, Columbus, OH on 25 July 1944 and joined Company D, 508th PIR.